PARIS (Bloomberg) -- Vincent Bollore is targeting Los Angeles and Singapore as the next markets for his electric-car sharing service after its debuts later this year in London and Indianapolis. After signing a partnership last year to put his batteries in cars assembled by Renault, the businessman is seeking more partners to expand the venture, he said on Wednesday in an interview with Bloomberg in Paris, where the service started. 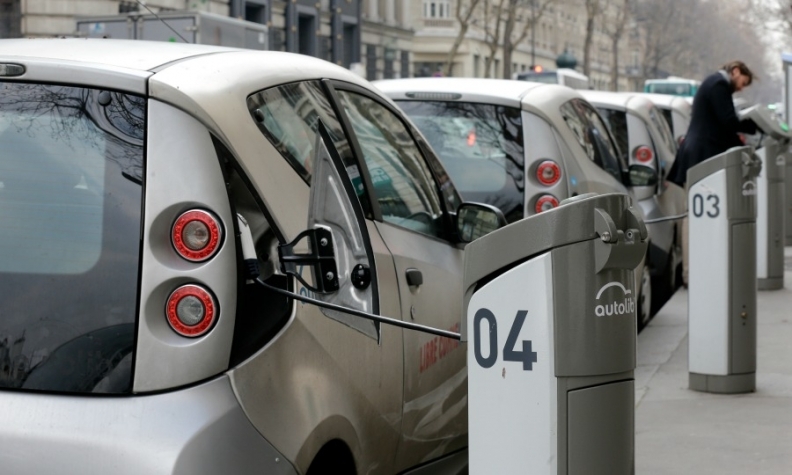 Bollore forecasts the unit, dubbed Autolib, will stop losing money this year. "There is a big demand because of pollution, which is a very important matter everywhere in the world," Bollore said. "You can't solve the problem with a very expensive car. What we've developed is a very robust and very cheap battery and car, which we have been demonstrating in Paris over four years now." Bollore, who owns battery-maker Blue Solutions, started Autolib in 2011 to show he can make electric-car batteries that stand the test of time and resist daily usage. The French car-sharing service, with about 70,000 subscribers, would need to increase that to 82,000 to be profitable, Bollore said. The 62-year-old Frenchman invested about 3 billion euros ($3.4 billion) in the project. Autolib now offers 900 charging stations and 2,900 Bluecars in Paris, and the Renault-Nissan alliance started a car-sharing joint venture with Bollore in September. Bollore started his car-sharing service with the so-called Bluecar, which can travel about 150 miles (250 kilometers) per charge. Since then, he's added other vehicles to his product range, including a convertible called Bluesummer, which he wants to see rolling on the U.S. west coast if his project succeeds in Indianapolis, he said. His business model in this segment contrasts with Elon Musk's Tesla Motors Inc., maker of the premium Model S sedan, whose price starts at $70,000. "We've embarked on a very different path, which is a people's electric car, democratic, that everyone can use," Bollore said at press conference. "Tesla positioned itself on the completely opposite end of the range. Overall, all this goes toward the same direction and this is very positive." Autolib is one of Bollore's more recent ventures. France's 10th-richest man, with a net worth of $5.2 billion according to the Bloomberg Billionaires Index, has holdings ranging from the largest transport and logistics operations in Africa, across 46 countries, to a majority stake in advertising agency Havas SA. Also Vivendi SA's chairman, Bollore has been leading deliberations on how to spend the company's cash pile as it scouts potential acquisitions after selling more than $30 billion of assets in the past year and a half.